Tomas Rosicky has rejected the chance to leave Arsenal this January, with the experienced star willing to remain at the Emirates Stadium and fight for his place. Czech journalist Karel Haring confirmed on Twitter that his compatriot would be staying with the Gunners, his agent allegedly revealing his client’s intentions to remain in the English capital. The 34-year-old was a top target for Greek side Olympiakos, but turned down the chance to join them after holding talks with Arsene Wenger; despite a lucrative deal reportedly being offered. Rosicky hasn’t been the first name on the teamsheet this season by any means, but has been an important player for the North London club over the past few seasons. The Czech Republic international often becomes a more influential player as the season wears on, with Wenger clearly feeling the need to manage the veteran midfielder’s game time as he enters the twilight of his career. He has made over 230 appearances for the club in all competitions, and will be hoping to add to that figure in the second half of the 2014/15 campaign. 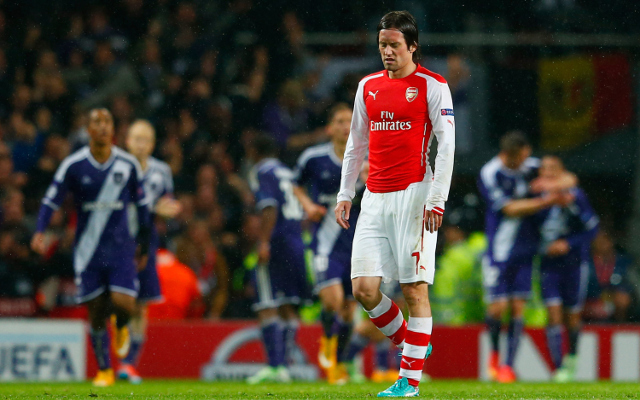 Did Arsenal star hint at Tomas Rosicky retirement during yesterday’s victory over West Ham?